Over the last five years of working with real estate agents and brokers, I’ve come to understand their marketing needs. One of the main concerns is that they believe video assets are useful, but also a financial risk. After all, it is an additional investment in a property and it has no guarantee of a return. But after further discussion, I am able to explain why in the long run, it's extremely valuable to have at least one strong piece of video content in your marketing repertoire. Let me explain. First and most obviously, creating video content to market a property has proven to lead to a higher chance of selling the property. As the digital world continually shifts towards video, it is essential to own a strong piece of video that you can lean on. Ultimately, it can be the make or break for potential clients. 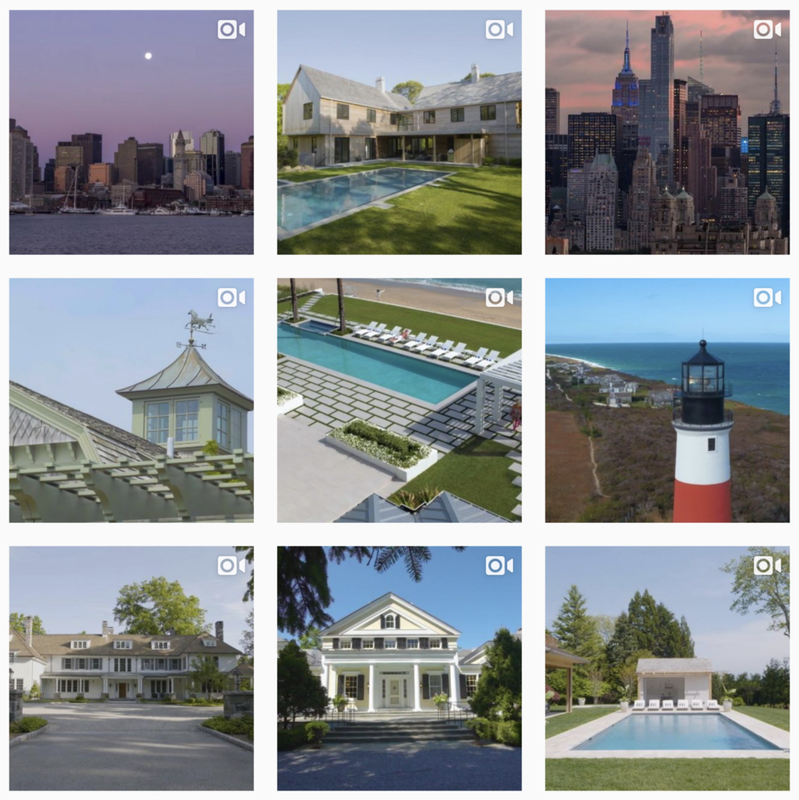 For my business, we have a proven blueprint (timelapse photography, aerial footage, an intensive location scout) that has brought clients from Ferrell, Douglas Elliman, Compass, and Sotheby’s a ton of success. There’s just no denying it is essential to invest in real estate video in 2018. Say for one reason or another, the featured property doesn't sell. Most people would think they now have a useless piece of content that will rot on their hard drive for the rest of eternity. But I have helped clients find plenty of ways to re-use these videos after it’s initial life cycle. 1. Feature it on your personal site: Past clients have built their website’s landing page around our video because they want to associate their name and personal brand with a high quality piece of content. It is the first thing a visitor sees when they visit our client's website. This includes using the video as a background banner to having the full video featured on the homepage. 2. Present it during meetings: Brokers have credited our videos as the main way to impress new clients in person. Whether it's a key part of a presentation during their initial sales meeting or having it loop on the office’s TV screens, they find a way to get it in front of new clients. 3. Feature it on your social media channels: We always deliver dozens of smaller, more digestible pieces of content that can be used on Facebook, Instagram and Twitter. If a client of mine has an online presence, these become extremely valuable assets. We deliver several edits that feature the most eye popping, attention grabbing parts of a video to pull their followers in and make them look like Instagram influencers. Some clients even go as far as running paid advertisements targeting specific audiences who may be attracted to their next listing. Using these platforms allows our clients to tag other contributors in the video, such as the appliances (@subzero), the designers (@interiordesigners), etc. This further spurs conversation and engagement. In today's competitive real estate market, it is vital to find ways to stick out, and having a well laid-out video marketing campaign has proven to be a huge success to top brokers at top agencies. Shoot me a message and let’s find out how we can grow your real estate business. With every property, there is a golden opportunity to build a narrative and showcase a lifestyle through the unique features that it possesses. That’s exactly what 929Media specializes in, and I want to run through some fundamental methods that help us deliver top results using one of our most successful videos, our Ferrell Building property video in Manalapan, Florida, as our prime example. The property was sold soon after the video circulated. The most important thing we do first is get together with our client and hit the whiteboard. Together we pin down the exact demographic we want. Yes, this sounds obvious, but we’re looking at this not just from a marketing angle, but also a video production angle. Where do they shop? What they wear? What do they drive? We need to know what brands we will be putting in front of the camera and why. We then compile a mood board as a visualization tool, giving us a clear idea on what we’ve landed on and making sure that we’re on the same page with the client. We then use this mood board to build out a narrative of the video and determine how the characters will look, from their hair style to their shoes. Models are the perfect tool to help create a narrative and drive it forward. They are a pallet for potential buyers to project themselves onto; they can easily visualize their best lives in their dream houses. We always encourage the use of models in any project we take on for this reason. It’s crucial to start these videos with shots of the property from the perspective of the environment it is in. In this case, we utilized the ocean and the palm trees blowing in the wind to give the client an idea of just how boutique this house feels. This really sets the stage for the property that we’re about to explore. Another key element to making an engaging real estate video is to capture the personality of the property itself through the golden moments it possesses. This is our mantra. And it all starts with a rigorous walk through. As a field producer, I’m constantly aware of my toolkit: two videographers, a drone operator, a time lapse specialists, and an assistant. During the walk through, I take notes of all the key rooms and features that will be perfect to capitalize on, specifically checking each room and understanding how the natural light shifts throughout the course of a day. Each room has it's own “golden moment” at different times. For example, the kitchen can be best experienced during sunrise while the dining room is best during sunset. Lastly, you need a strong post production team that can put together a strong video that makes this all worth it. I’m talking color correction, sound design, editing, etc. We’ve had clients in the past just ask for raw footage, only to see it all be poorly edited and ultimately wasted. This is a proven blueprint that I use for my business with almost every property project that comes our way. As you can see, we used it during our shoot with Ferrell’s Manalapan property, the most expensive zipcode to live in in the United States. We were happy to learn that the building was soon sold after the video was published. Have a property that you think fits the bill? Shoot me a message and let’s chat. Check out the final video below! A real estate agent can use just about any media to market a property. But the use of the right media in the right way can get the best results for both the agent and the client. Videos produced by 929 Media are an effective way not only to get the attention of a potential buyer or lessor, but they convey emotions that can inspire that person to contact the listing agent. Emotions drive our purchasing decisions, especially when it comes to real estate. We see our homes as reflections of ourselves, especially if you are in the market for high end real estate properties. There are practical considerations when buying any real estate but we’re all looking for a home, a place that fits our personality, a place where we can be ourselves and a shelter from the rest of the world. This video of a property in the Georgica section of East Hampton, New York, is an example. If you’re in the market for property in this area of the world you’re financially successful. You probably live a very busy life and there’s a good chance that life is being lived in one of the busiest and most congested places on the planet, New York City. If this is your situation you probably want a place to get away from your everyday life, but not so far that it’s impractical to get to and from that place. Through this video you get a feeling of being away from it all, of being able to enjoy peace and quiet, a place to relax, a place where your kids can be kids and enjoy wide open spaces. Through this video you see that what’s for sale is not just a couple buildings on a piece of property. What’s for sale is a sanctuary. The facts of 81 Briar Patch Road will help close the deal. An approximately 1.9-acre property located on Georgica Pond near the Fulling Preserve in East Hampton. This magnificent 12,000 square foot home designed and sourced by preeminent builder Jeffrey Collé boasts 203 +/- feet of direct frontage on Georgica Pond. The pond side 25' x 45' foot infinity-edged pool and spa, complete with outdoor grilling area, is surrounded by a wrap around terrace of beautiful Turkish limestone. If you want to discuss how well produced videos can unleash the power of positive emotions to help you sell or lease high end real estate properties, contact 929 Media today so we can talk about how we can help you and your clients. Videos have become a common tool to help sell real estate and for good reason: they work. Videos of properties make it easier for prospective buyers to narrow down their choices. Because increasingly time is money, prospective buyers are looking to videos to help them focus on properties they feel may be right for them and are worth seeing in person. Buyers flock to videos, reports Reuters. About 90% of potential real estate buyers use the internet to search for homes, according to National Association of Realtors spokesman Walter Molony. Of this group, back in 2012, 21% said they use or look for online videos. If your client wants to sell high end residential real estate in New York City and the surrounding area, your potential market isn’t just those in and around New York City. Because it’s one of the world’s greatest cities potential buyers are across the globe, at their computers, looking at listings and watching videos. Because videos of real estate for sale have become so common, you need yours to stand out. If you have a high quality property for sale, you can communicate that high quality with a unique, beautifully shot video from 929Media. 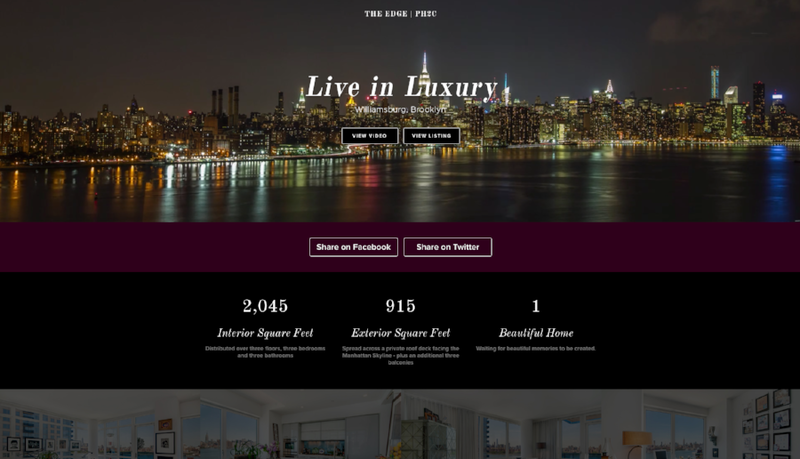 One example is the one for penthouse 2C at The Edge in Williamsburg, Brooklyn. If you’re going to have a video produced of property you want to sell, do it right. Contact 929Media so you can discuss the property and your needs. You can also learn about how we can work together to help you tell your story to potential buyers around the block and around the world.